The TNM Classification of Malignant Tumours, 8th Edition, published in 2016, provides the latest, internationally agreed-upon standards to describe and categorize cancer stages and progression. It contains important updated organ-specific classifications that oncologists and other professionals who manage patients with cancer need can use to accurately classify tumours for staging, prognosis and treatment. Order your copy now (UICC Members have a discount on Wiley Publications). The TNM Classification 8th is also available in other languages. Please click here for more information regarding the translations. For any queries about the classification, please visit the FAQ's page or ask your questions at the TNM Helpdesk. 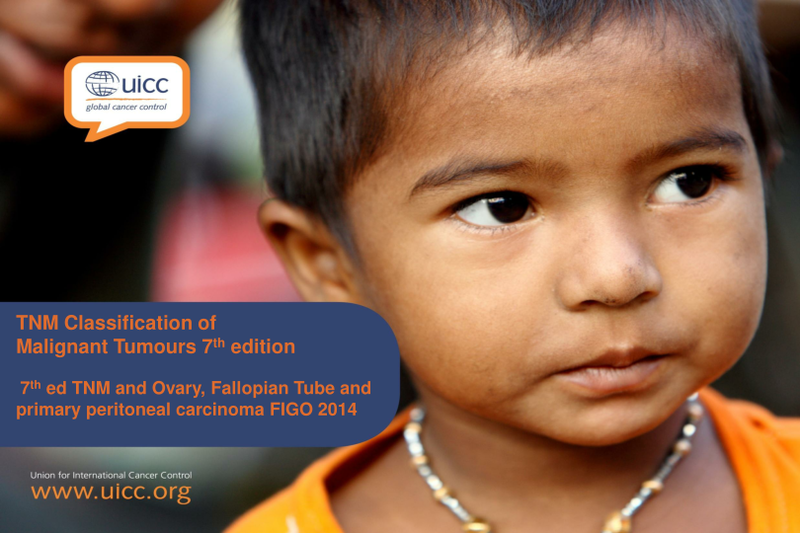 FIGO has published a new classification for ovarian cancer. * This classification incorporates cancers of the fallopian tube and primary peritoneal carcinomas. These new cancer staging rules have been incorporated into the 8th Edition of the UICC TNM Classification of Malignant Tumours which became effective on January 1, 2017. For a comparison of the current TNM for ovary and the new FIGO classification and proposal for the 8th edition go to this presentation. The TNM Supplement: A Commentary on Uniform Use, now in its 4th edition, extends and clarifies The Union for International Cancer Control (UICC) TNM Classification of Malignant Tumours, providing additional data that unifies the principles and practice of cancer staging. The TNM Supplement provides explanations and examples to answer many questions that might arise in the course of the daily use of TNM, particularly in unusual cases. It enumerates the recommended criteria for pathological classification (pT and pN) and contains proposed classifications for new tumour sites and types that are not part of the official UICC TNM system yet. The TNM Atlas 6th Edition, as a companion for the TNM Classification, is designed as an aid for the practical application of the TNM classification system by illustrating the T and N categories in clear and easily understandable graphics. The aim of such a presentation is twofold: to enable all disciplines involved to reach a more standardized understanding and documentation of the anatomic spread of tumours, and to further enhance the dissemination and use of the TNM classification. The 6th edition of the TNM Atlas was released in May 2014. The 9th edition of the Manual of Clinical Oncology adopts a multidisciplinary perspective and gathers expertise in different fields of cancer management to be used by all health professionals working in oncology. It aims to strike a balance between delivery of a high quality services and realities of the day-to-day practice, including that of resource-limited settings. The 9th edition was released in September 2015. 56 lead authors worked on various key cancer management and treatment issues and disease-specific approaches. Other Wiley & UICC publications are available from the Wiley-Blackwell website.